Simple. Glorious. Classic. The Hot Lob. 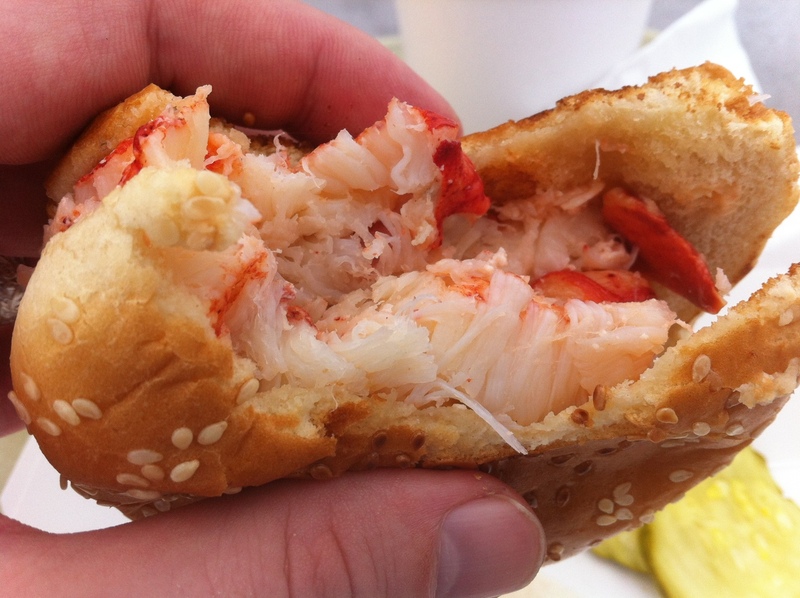 Longtime readers of this blog – and people who know me personally – are well aware of my love for Abbott’s Lobster in the Rough in Noank, Conn. and in particular their utterly winning sandwich, the Hot Lob. Indeed, the first entry in this blog is about the Hot Lob. In an article elsewhere, I characterized the Hot Lob as the best sandwich I’ve ever had, and the best there is, period. Now as time as worn on, none of my affection for Abbott’s has diminished, nor their stellar Hot Lob, but I have been enough times to realize that it is a place that succeeds because the whole is greater than the sum of its parts. The Hot Lob is amazing – but is it better than a Luke’s Lobster Roll? – I am no longer as certain. Sometimes the answer is definitely yes – when you get a piping hot Hot Lob, as opposed to the lesser and unfortunate Luke Warm Lob. But the place is better, the view is better, the overall atmosphere is better, the sandwich is delicious, the bisque marvelous, etc. etc. etc. 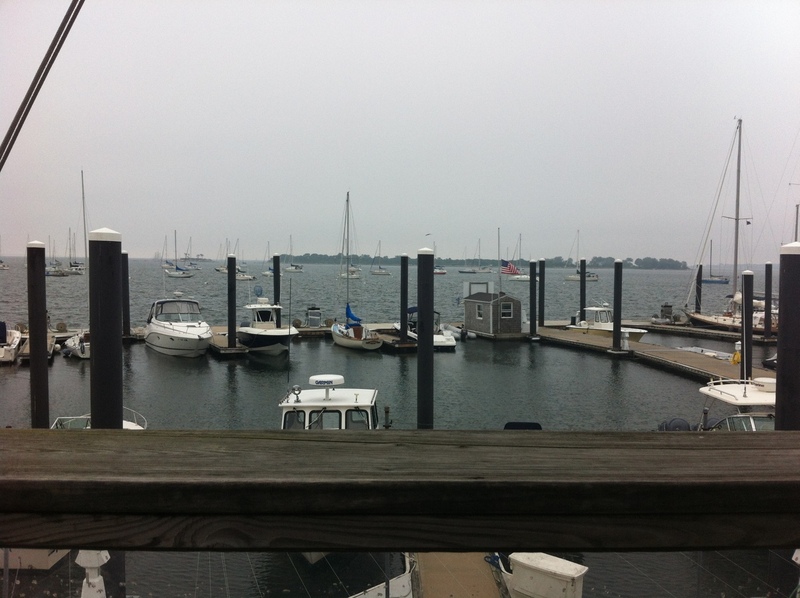 Indeed eating a Hot Lob while watching boats tweedle by on even a gray day is marvelous. It is certainly one of my favorite places on Earth and feeds both me and my soul. (N.B. New for the 2012 season is Abbott’s “O.M.G.,” essentially a hot lob with double the meat, some seven ounces, piled into a ridiculous cone between the bun. I did not venture to try it this time). Abbott’s has a clam shack sister a few hundred feet away – Costello’s – so despite a day’s gluttony at the former (Hot Lob, bisque, corn on the cob, cole slaw, potato chips) – we decided to give it a whirl. 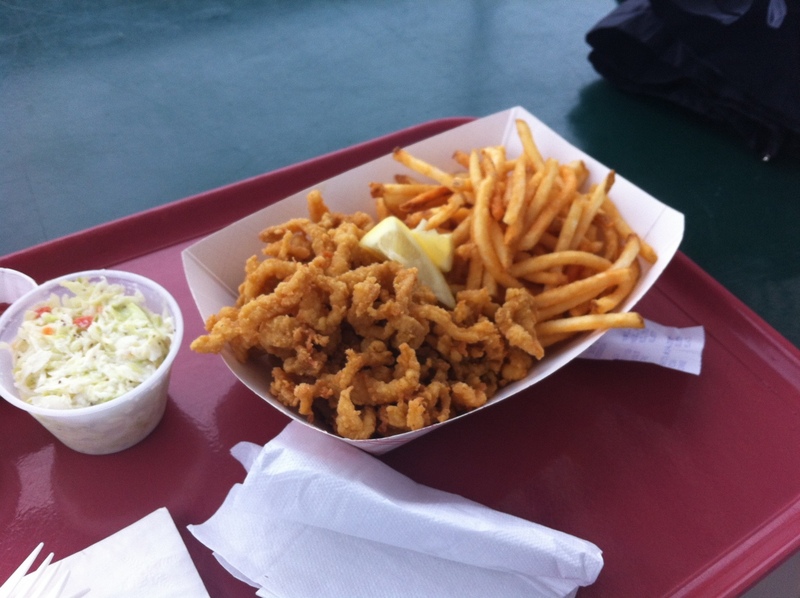 Whereas Abbott’s does lobster in the rough and so on, Costello’s does fried clams. The approach. The tented structure at the end of the dock is Costello’s. A word about the venue itself. 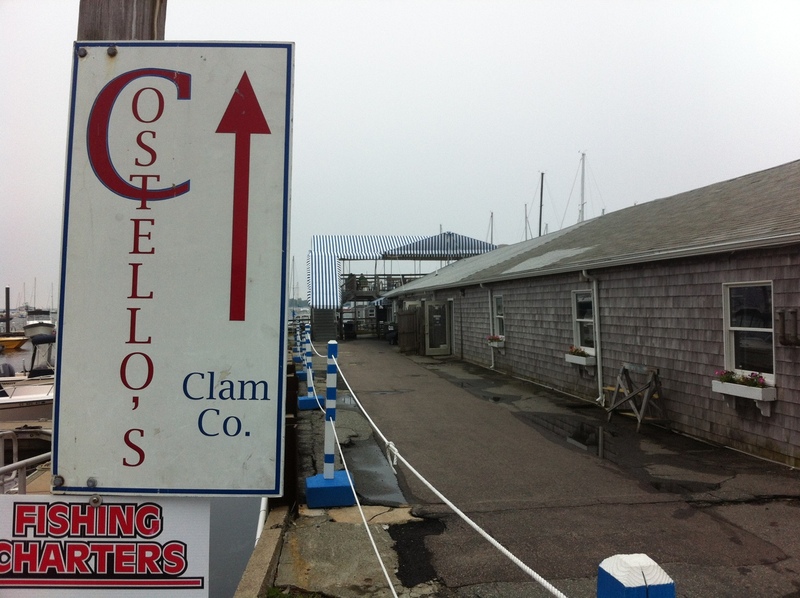 Costello’s is located in a working dockyard. It is further down the same narrow, slow-speed street as Abbott’s. You pull in to a large parking lot and find your spot. Then it is a march down to the edge of a pier, and there, split on two levels, is Costello’s. On the lower level, you order you food. You can also eat at a few picnic tables. Above, there is more seating, under a tent-like roof, with tables and chairs as well as picnic tables. The view from the upper deck. It is very nice, but not quite as pleasant as the view from Abbott’s. The view is not as charming as Abbott’s, nor is the place. The view that immediately greets you is more docks and parked boats, as opposed to Abbott’s, where the boats go slowly past on their way out of the harbor. The boats pass Costello’s as well, but not quite as close, and there’s the intervening nautical parking lot and pier to see past. It’s neat, but not as nice. The menu contains a lot of duplication from Abbott’s! Another source of the Hot Lob! 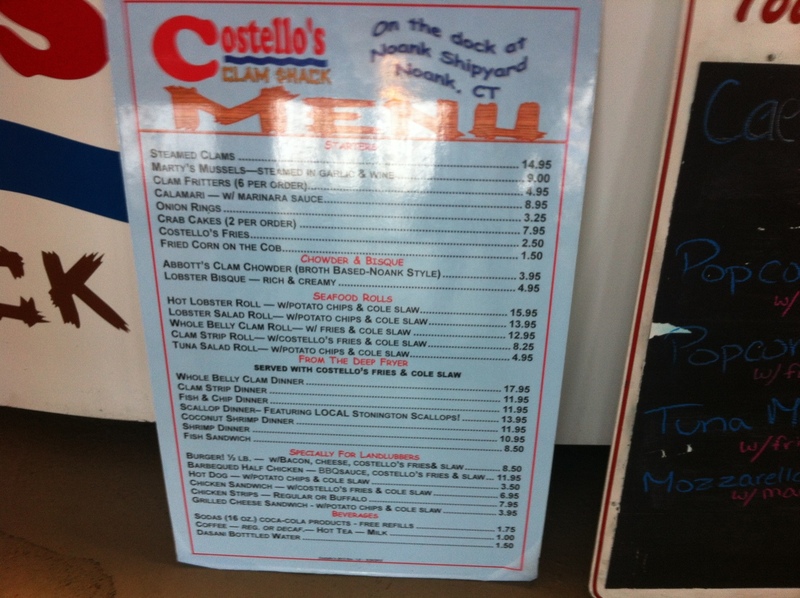 A pleasant surprise at Costello’s is this: You can get a Hot Lob there! I was well surprised to see that nearly the entire Abbott’s menu is duplicated. So it turns out there is a second place on Earth where you can get them… . Nonetheless, it was for the clams we came, and so, ordered them. They come in two varieties: strips or whole bellies. Conferring with our teenaged server she suggested, it being my first visit, to get the strips, and, if finding them agreeable, advance to whole bellies another time. They were agreeable indeed, very much what you think they are: breaded clam strips. Crunchy but not to the point of having lost all of their clam meat within. Flavorful without being fishy. Crunchy and not greasy. Very pleasant and on balance wonderful clam strips. However, I do not know that they make for destination dining the same way the Hot Lob does. They are delightful for scratching your fried food itch, and I think I rate them better than most clam strips I’ve had, fresher perhaps, but nonetheless it is a deep-fried thing you dip in tartar sauce. A closer look. It is hard to tell in this photo, but trust me, those fries are skinny (and delicious). The french fries they are served with, however, really caught my attention. They are cut so narrow and thin to be more like strips than fries. They are utterly wonderful. On balance it is easy to recommend Costello’s. If you are going all this way, however, the Hot Lob should remain the primary target. 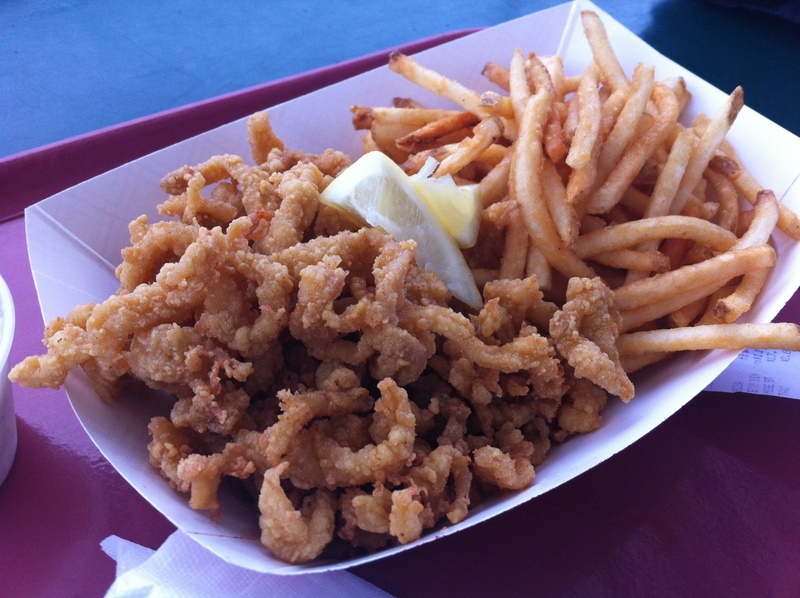 Costello’s fried clams are delicious, but mostly if you or one of your party is having a fearsome hankering for fried food. If going with that person, you should get the Hot Lob, and steal some of their fries.